How are you all? Can you believe it's September? I have a little haul shopping for you today. I've been rummaging in TK Maxx again. Its becoming an addiction. My local stores have been a little disappointing recently I am hoping for a new influx of goods. I picked up Physicians Formula pressed powder which is 100% free from harsh chemicals, synthetic preservatives, paraben, GMO's, synthetic colours, synthetic fragrances and cruelty free (£4.99). You know my other passion in life is food. I went to my newly discovered local independent health food store and purchased the goodies you see below. Daymer Bay Ice Teas (Elderflower Green Tea & Mango), Amy's Kitchen Dairy Free Macaroni Cheeze, Clive's Pies (Mint Chickpea), Bessant & Drury Dairy Free Lemon Ice Cream, Fry's Pops, Edam Style Sheese, Lucy's Cinnamon Thins & Maple Bliss, The Living Food Kitchen Raw Pumpkin Pie and Organica Vegan Golden Coconut & Dark Chocolate Bars. This week I also tried out Redwood's Meatless Feast Pizza (meat, egg & dairy free). This was better than the Mama Cucina Pizza because it's not gluten free and had a good amount of topping. 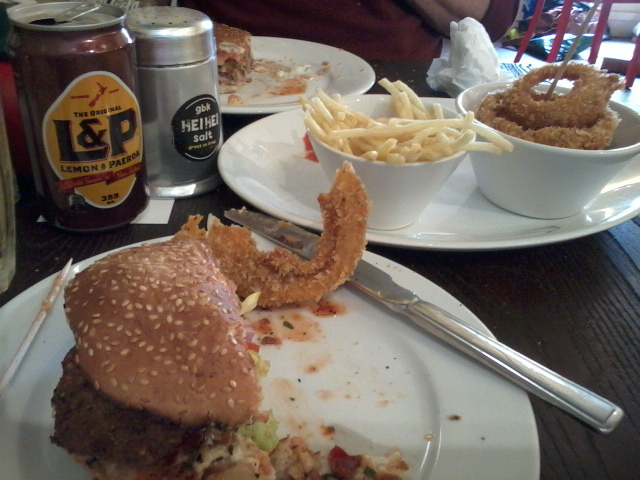 Yesterdays lunch time treat was a visit to GBK. Oh how I love a good falafel burger and a can of L&P. That sums up my Saturday. I hope everyone has been having a lovely weekend. Love the look of that Pizza! I did see PF at Tk Maxx, but I didn't feel the need to buy anything. I will keep visiting there to pick up a bargain :) If you haven't tried their mascaras, you should! What is GBK? :( I'm curious as to your thoughts later on about the Physician's formula product you picked up. I think that brand is okay, but the organic mascara burned my eyes soooo badly! The powder seems good but there's not a lot that can go wrong with a powder. Sorry to hear about the mascara, I don't wear any eye makeup so I wouldn't be looking to try that one.